This section contains documents and articles gathered through time, on a variety of subjects relating to the Forgotten Realms campaign world. This is mainly official Realms work, most of which has been released by TSR\WotC. Other Realmslore can be located in the Travelers Notebooks section. Candlekeep claims no ownership or contest to the copyright of the items listed below. The Candlekeep Compendium An excellent collection of many articles of Realmslore in PDF - By various scribes of Candlekeep. 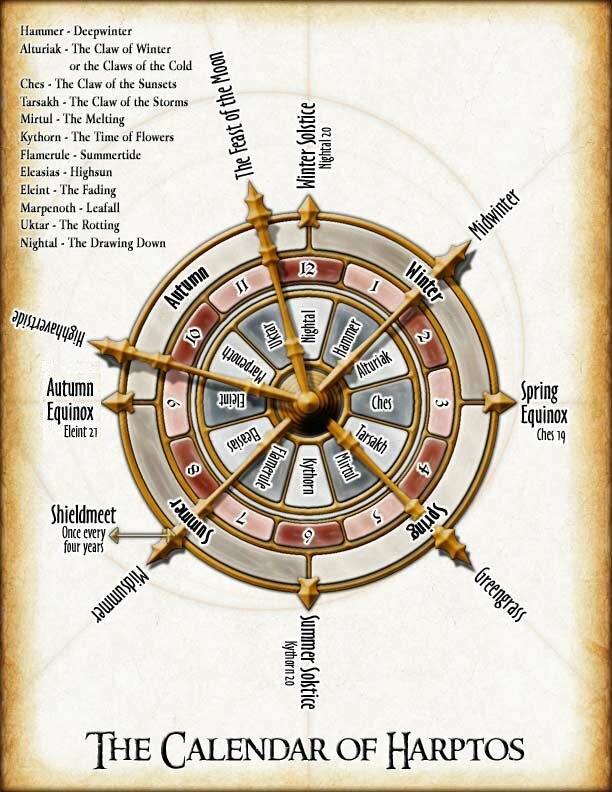 The Faerûnian Calendar A graphical chart showing the full Faerûn month names. The Complete Toril Timeline A valuable document listing every event ever recorded for all continents on Toril. The Roll of Years The Roll of years in numerous formats and sorted orders (thanks to Chris Jameson). Forgotten Realms Bibliography A complete list of every Forgotten Realms product produced by TSR\WotC. Drow Glyphs Chart of house glyphs of the drow race. 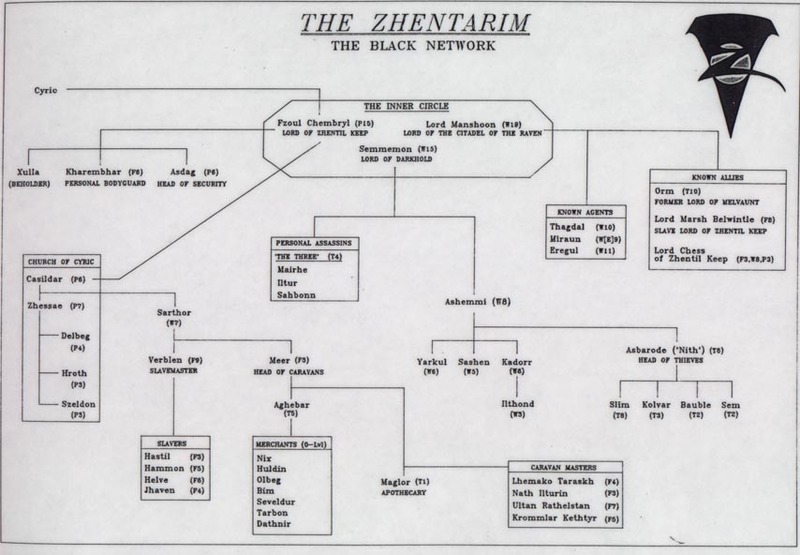 Zhentrarim Organization An old hierarchy chart showing part of the structure of the Zhentarim. 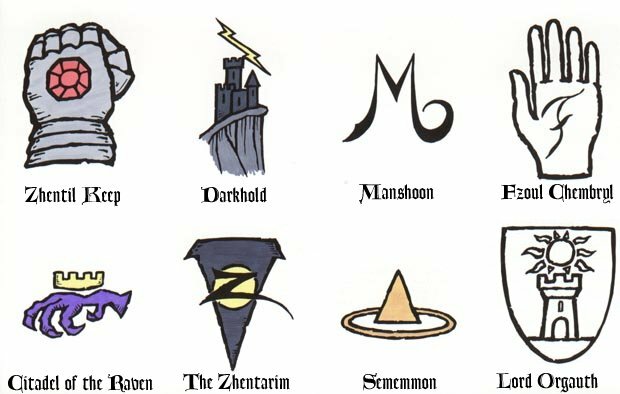 Zhentarim Symbols Marks, symbols and mage sigils of the Zhentarim. Forgotten Realms Index - Part 1 A list of all Forgotten Realms articles/adventures from Dungeon and Polyhedron. Forgotten Realms Index - Part 2 A extensive list of all Forgotten Realms articles to appear in Dragon Magazine. FR Dragons's Bestiary A list of all Monstrous Compendium creatures to appear in TSR publications. Preview of Lands of Intrigue Chapter one preview of the Lands of Intrigue campaign expansion. Tethyr Nobles and Court Celebrities Extracts from the Lands of Intrigue campaign expansion. Money and Art Objects Taken from the Forgotten Realms Adventures hardcover. 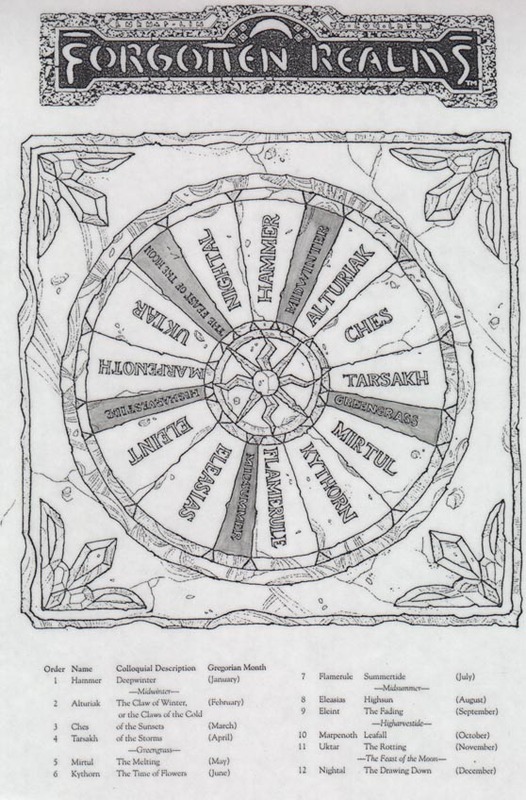 Faiths and Avatars Template Template for designing Realms deities and speciality priests. HoundMaster Statistics PDF file detailing a new fighter/ranger kit (from 'Demihumans of the Realms'). PestKiller Statistics PDF file detailing a new thief kit (from 'Demihumans of the Realms'). The Throne of Bloodstone Official TSR FR adventure (H4), the last in the Bloodstone Lands quartet. TSR FR Electronic Downloads Links to free Forgotten Realms product downloads offered by WotC. The Candlekeep Collection Listing of all tomes and volumes to appear in Realms fiction. Phases of Selune Chart and details of Toril's moon phase cycle. FR Novel Reading Order Forgotten Realms novel timeline for chronological reading. Five-day Weather Forecast of Waterdeep Simple chart on the WotC FR site forecasting the weather and giving the moon phases. "Never a Warpig Born" Story by Ed Greenwood from the 'Spin a Yarn' Seminar at GenCon 2001. Drizzt Do'Urden 2nd ed. AD&D Statistics Drizzt Do'Urden game statistics for 2nd edition AD&D. Drizzt Do'Urden 3rd ed. D&D Statistics Game statistics by WotC for this popular character, updated to D&D 3rd Edition. Dogs of the Realms Information on uncommon dogs of the Realms and a 'Create Frenzy Dog' spell. Shandril and Narm, Heroes of Spellfire New 3rd edition game statistics on the two heroes from Spellfire and Crown of Fire novels. The Beasts of Halruaa Info and Stats on two creatures of Halruaa: the Halruaan Behir and the Starsnake. The Bard's Rumours section features articles which may settle some questions about the Forgotten Realms. No contest is made for ownership of the content of these pages and all copyrights are acknowledged to Wizards of the Coast. This material is reproduced here for archive purposes only and text and graphic content remains the property of WotC. Some of original articles are available on the WotC web site. Is the future of the Realms at stake? No more Forgotten Realms Adventure Modules to be published! "One Comes, Unheralded, To Zirta"